VIE's unique Cost Reduction Services thoroughly analyze operational expenses. VIE’s unique Cost Reduction Services thoroughly analyze operational expenses. Today’s healthcare industry is increasingly complex. Fast-changing regulations, more competition, and rising hospital purchased service costs make it difficult for healthcare organizations to stay profitable—without compromising quality patient care. Here at VIE Healthcare, we can help you do it all. For nearly two decades, our team of experts have stood at the forefront of healthcare. Pioneering new strategies for operational efficiency, profitability, and patient satisfaction, we’re always ahead of the industry curve. As a result, VIE can rapidly address your organization’s priorities and prepare you for change. We know that the healthcare world is constantly in flux. That’s why we leverage change as an opportunity for growth. As your trusted partner, VIE can maximize profits and optimize performance, while you focus on delivering exceptional patient care. Whether we’re working with a large IDN, a mid-sized hospital, or a post-acute care organization, VIE’s approach to hospital purchased services is always holistic. First, we identify operational strengths, weaknesses, and opportunities. This enables us to plan for effective and sustainable improvements. We then focus on practical and flexible strategies to dramatically improve the organization. 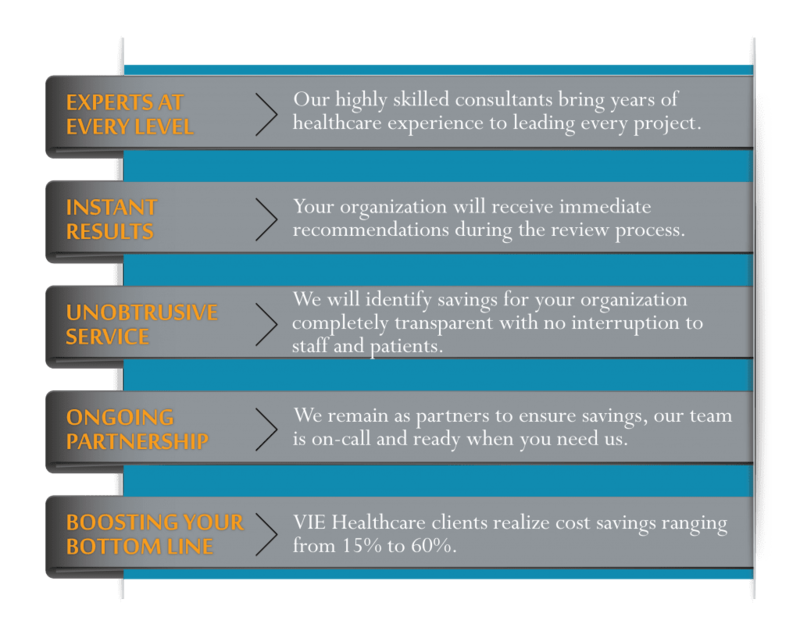 One of VIE’s specialties is cost reduction, where we save clients millions of dollars. Our experts navigate procurement pitfalls while you stay focused on your core business. Throughout this process, VIE checks for errors, identifies savings opportunities, and even negotiates refunds with vendors on your behalf. We’ll also show you how to consolidate your vendors to help leverage your buying power—and then we’ll negotiate for better pricing. 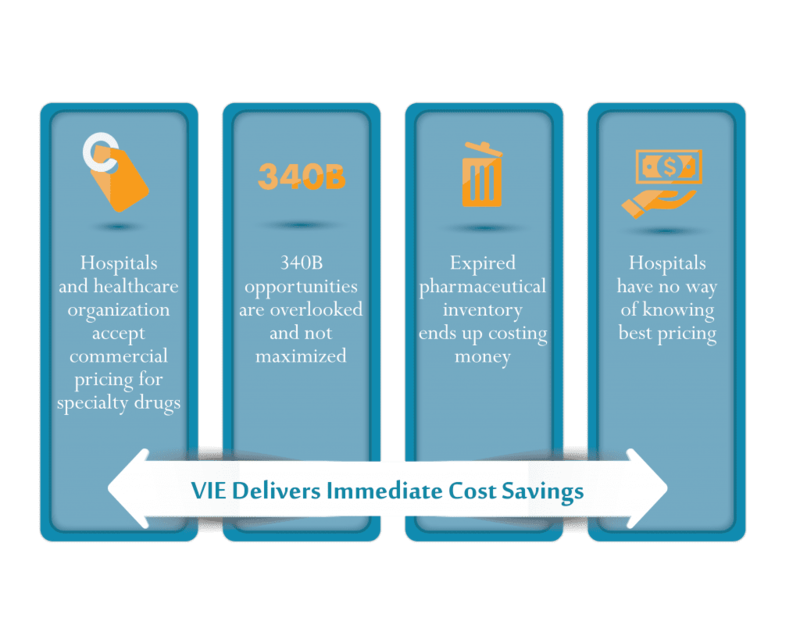 Expressed as a return on consulting fees, VIE will help you realize a multiple return on our fees through the rapid implementation of powerful cost-savings initiatives. So what are you waiting for? Please reach out to Denise Bisogno at dbisogno@viehealthcare.com to see how VIE can transform your healthcare organization.